Fresh from two sold-out nights at Ronnie Scott’s in January and a critically-acclaimed performance at the BBC Proms last summer, the National Youth Jazz Orchestra are coming to The Apex, and this time they’re bringing their friends. 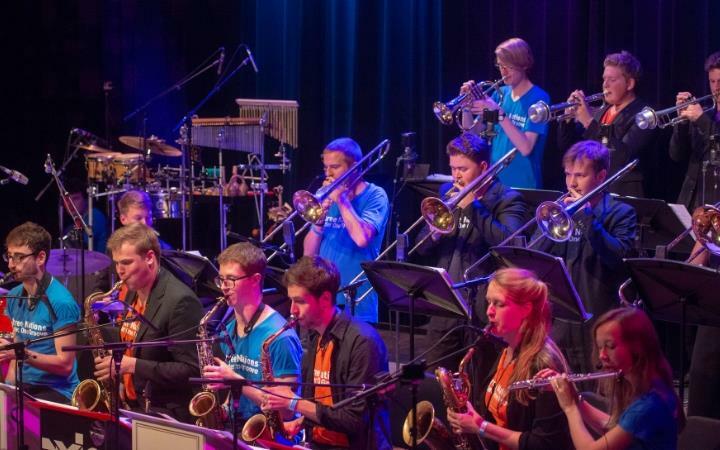 Three Nations Under One Groove is a collaboration between the National Youth Jazz Orchestras of the UK (NYJO), Germany (BuJazzO) and Holland (NJJO). This is 70 of Europe’s top emerging professional jazz musicians up to the age of 25 grooving and soloing hard, with all the explosive might of a world-class band. BuJazzo’s contribution to the programme is the work of the Kurt Edelhagen Orchestra - the dominant European big band of the post-war era, that famously collaborated with the American jazz pianist, Mary Lou Williams, in 1954. NYJO will present contemporary works and arrangements by its Artistic Director Mark Armstrong and band members that explore the breadth of the modern British jazz orchestra sound, including a jazz arrangement of Gustav Holst’s ballet music from The Perfect Fool. NJJO brings the music of contemporary Dutch guitarist Anton Goudsmit – with his distinctive upbeat grooves - and their Music Director Johan Plomp.